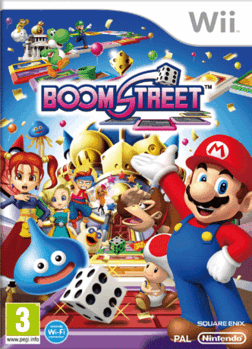 If you’re thinking that Nintendo’s decision to release Boom Street on Wii on 28th December was a strange one, then you’d be right. Most gamers are still playing the games they received for Christmas while retailers are focused on promoting their sales rather than shifting new releases. As such, Boom Street not only fails to make the UK top 40 but also the Wii top 40. Elsewhere in the chart it’s business as usual. FIFA 12 holds onto the top spot for a second week running, followed by Call of Duty: Modern Warfare 3, Battlefield 3, Just Dance 3 and Assassin’s Creed: Revelations. As predicted last week, the sales have had an impact on the charts. RAGE is the game that has benifited from a price drop the most – it’s back in at #12, up from #29. £9.98 at GAME, if you’re wondering. WWE ’12 has shot back up the chart too, up from #23 to #13. Spare a thought for EA’s Star Wars: The Old Republic though – it has been forced down from #10 to #38 this week. …The Elder Scrolls V: Skyrim, ladies and gentlemen. The mammoth RPG has become the first UK Christmas number one not to be published by either EA or Activision since 2002’s GTA: Vice City. Neither EA or Activision has made #2 – it’s Just Dance 3 that clocks in below Skyrim. Sales between the two were 15,000 copies apart claims Chart-Track. EA and Ubisoft owned much of the chart last year while Sony and Microsoft managed one title each. Not much has changed this year apart from no first-party games from Sony and Microsoft to be seen. There wasn’t a single Nintendo-published title in last year’s chart, although Just Dance 2 was a Wii-exclusive. This year Just Dance went multi-format which explains why Just Dance 3 has charted higher. Poor reviews of NFS: The Run have presumably harmed sales but the brand is still clearly desirable. Nintendo has a better presence this year but it’s sad to see no 3DS games in the top 10. Professor Layton is better than nothing, I suppose. Sales on the high street, specifically at Game and GameStation, have seen dozens of titles climb back up the chart – Modern Warfare 2 is up from #9 to #3, Alien Vs Predator goes from #21 to #15 and Wolfenstien is back at #38 due to being cut to £9.99 at the former retailer. Invizimals on PSP makes a surprise appearance at #28 thanks to also being heavily discounted – £9.99 at GameStation with the PSP camera, if memory serves. 2010 FIFA World Cup South Africa – to give it’s full and correct title – is still #1 though and Just Dance is at up one place at #2 pushing Super Street Fighter IV down to #6. Iron Man 2 rises up from #20 to #12 now that the slightly lacking movie is out while Wario Ware DIY is the only new entry at #24. The Wii’s big white hope Monster Hunter Tri had a bad week, dropping from #12 to #26. Publishers – if want your new videogame to sell, simply stick the word ‘just’ in the title – Just Dance has gone back to the top of the top 40 chart this week, while Just Cause 2 drops to #2. New DLC for Call of Duty: Modern Warfare 2 has helped it go back up from #6 to #4. I had another bash on the online mode the other day. I’m still deeply rubbish – 6 kills was my highest over the space of several games. Both Pokemon: Soulsilver and Pokemon: Heartgold are still in the top 10 at #5 and #7 respectively but God of War III and Final Fantasy XIII have now left the top 10. Metro 2033 is the biggest faller of the week, dropping from #14 to #32. If retailers cut the price to £20 or so, it could very well skyrocket back up though. Raise your hands in the air like you just don’t mind – Just Dance is #1 for the second week running. It’s now the first Ubisoft game since the original Assassin’s Creed to hold onto the top spot for more than one week. The knowledgeable bods at Chart Track also point out that the top 10 chart is made up of games from only three different publishers this week with Nintendo publishing no less than four of them. Predictably, Resident Evil Archives: Resident Evil Zero doesn’t enter the top 40. The best it can do is a #31 placing in the Wii budget chart. Dark Void – also by Capcom – fares better, going in at #33 in the multiformat chart. It’s at #16 in the PlayStation 3 chart and #17 in the Xbox 360 chart. Seeing reviews have mostly been around the 6/10 mark that doesn’t seem too bad to me. Shock! Call of Duty: Modern Warfare 2 has been knocked of its loft perch by Just Dance. If it wasn’t for Ubisoft’s uber rubbish dancing game then Call of Duty: Modern Warfare 2 would have been at the top of the chart for 10 weeks straight. Incidentally, Just Dance is Ubisoft’s first #1 since Tom Clancy’s Rainbow Six: Vegas 2 way back in March 2008. The much improved sequel Army of Two: The 40th Day is the only new entry in the chart at a respectable #4. Bayonetta has dropped from #5 to #7 while Darksiders has risen in its second week of release and goes up from #8 to #6. It’s also pleasing to note that Borderlands is back on the rise, going from #23 to #13. It has been something of a steady seller, which pretty much guarantees that a sequel will appear somewhen. It’s Monday, which means it’s chart time here on GamesAsylum. Let’s see how Bayonetta and Darksiders did, shall we? Yes! It certainly looks like THQ’s decision to hold Darksiders back until after the Xmas rush was a wise one – it has managed to get to #8 in the all formats top 40. Sega’s Bayonetta does even better, dashing in at #5. Call of Duty: Modern Warfare 2 is still #1, which makes it the 9th week running. Chart Track also point out that it has already become the third best selling game in the UK ever. I’m willing to bet that within the next six month it’ll end up being either the second best, or possibly best ever. Brain Training on DS and GTA: San Andreas hold the first and second positions, if you’re wondering. The rest of the top 10 has had a good old shuffle this week – the rubbish Just Dance is up from #7 to #3, Wii Fit Plus is up from #5 to #2, Assassin’s Creed 2 drops from #2 to #7 while Mario & Sonic at the Winter Games also slides all the way from #3 to #11. The Legend of Zelda: Spirit Tracks was the only decent game out last week, so I wasn’t expecting much action in the top 10 chart this week. Something very odd has happened though – Ubisoft’s Just Dance has gone all the way from #30 to #8. Reviews have been appalling – the average review score currently stands at 35% – so I’m guessing that it has been advertised on TV or something. Call of Duty: Modern Warfare 2 is still #1, while James Cameron’s Avatar: The Game is doing better in its second week of release now at #29. The Legend of Zelda: Spirit Tracks misses out of a top 10 ranking, having to make do with #12.